This is going to be an article in progress for the next few months so be sure to check back for updates. I was doing research for an article about Masterbuilt’s 130P McLemore Signature smoker and how it was different from the other Masterbuilt electric smokers when I saw that Masterbuilt is getting ready to launch the MES 400 series. 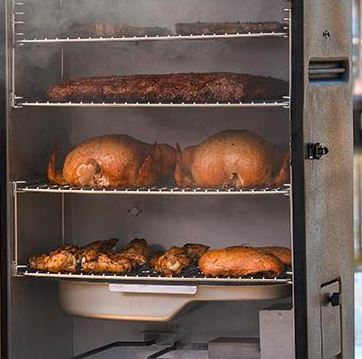 The MES 400 Series electric smoker looks like it could be a total game changer in the world of electric smokers. I am short on details but here is what I have seen so far. I am assuming that the 400 series is going to be a 40 inch smoker based upon past naming conventions. One huge update to the smoker is that, like the 130P, it will come with a top mounted broiler. This will let you smoke hamburgers low and slow and then sear them off under the broiler. It also has the potential to help crisp up rubbery chicken skin and get the sauce to set on your baby back ribs. I like the broiler. 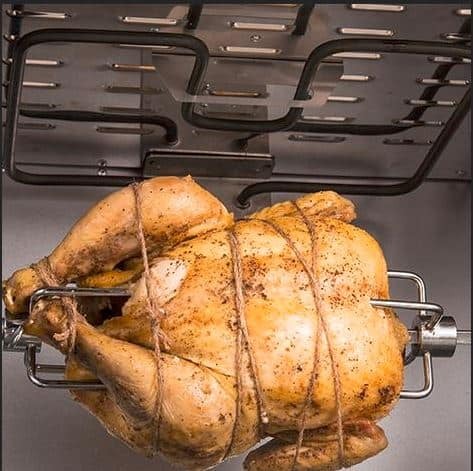 The other update, and the one that I suspect will get the most attention, is that it looks like it comes with a rotisserie!! The ability to smoke a chicken while getting a crispy rotisserie skin is a tantalizing opportunity! It also begs the question of can you operate both the smoking heating element and the broiling heating element at the same time?? I believe there are also serious changes coming to the wood chip addition system. Take a look at the bottom right side of this image of the smoker. The regular MES smokers have a side tray that pulls out for the addition of more wood chips. That slide tray is now absent and has been replaced with a door. 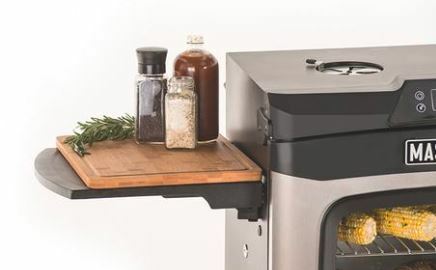 The change is access is accompanied by the text on Masterbuilt’s website that mentions a patent pending Custom Smoke feature with five different smoke level settings. The new smoker chip addition configuration almost certainly means that the MES 400 Series will not be compatible with Masterbuilt’s Slow Smoker accessory that lets you smoke for hours. It makes me wonder if the new system either has a larger capacity chip tray or if the Custom Smoke feature enables longer smoking times for a given load of chips. The other feature that is shown for this smoker is the addition of a side table. That is simple brilliance and is exactly what these smokers have always needed! I am guessing about the rest of the features but I assume this guy will have a built in meat thermometer and will be Bluetooth enabled. If you have any more information about the MES 400 series then PLEASE drop a comment below! When will the series be available? I assume in Spring, 2019. There is a sign up form on Masterbuilt’s site to get notified when more information is available. I signed up a week or so ago and haven’t gotten any follow up emails. I signed up Dec. 8th. Got one email in January that it was coming soon. Still waiting. Keep us posted if you learn anything!